Jakarta’s old airport Halim has re-opened to scheduled commercial passenger jet flights, slightly relieving congestion at constrained Jakarta Soekarno-Hatta. Garuda budget subsidiary Citilink became on 10-Jan-2014 the first of at least four major Indonesian carriers to launch flights from Halim, with eight frequencies on four domestic routes. Garuda, Indonesia AirAsia and Lion Air are also preparing to launch flights from Halim within the next couple of months. Lion initially planned to move the Jakarta operation of new full-service subsidiary Batik Air from Soekarno-Hatta to Halim but in a change of strategy has instead decided to move select Lion Air-operated frequencies on major trunk routes. Garuda and AirAsia are also expected to use Halim for some frequencies on domestic trunk routes. An overwhelming majority of flights will remain at Soekarno-Hatta, which is now operating at levels nearly three times its designed capacity, as there is only room at Halim for limited commercial operations. Halim Perdanakusuma Airport is a single runway facility about 10km southeast of central Jakarta which has primarily been used by the military and general aviation since Soekarno-Hatta opened in the mid 1980s. While Indonesian authorities for years have considered re-opening Halim to the major domestic carriers, the airport until this month was only open to freighter operators and regional carriers operating small turboprops under air taxi regulations. Halim was also re-opened in 2013 for Haj charter flights, which use widebody passenger aircraft but are seasonal. The decision by Indonesian aviation authorities to start allowing scheduled commercial passenger jet flights is a bid to reduce congestion at Soekarno-Hatta. But Halim is only able to support a small number of commercial flights given its ageing passenger terminal, small apron and the fact it is a single-runway facility without a parallel taxiway. Airlines using Halim also risk being subject to occasional delays when there are military training flights. In addition, Halim is used by private business jets and government VIP flights including visiting dignitaries. The re-opening of Halim for regular commercial flights had been planned for some time but was delayed multiple times as government-owned airport operator Angkasa-Pura II prepared the airport’s terminal for an influx of passengers. While Citilink started operations at Halim on 10-Jan-2014, its full-service parent Garuda decided to wait at least another month as the flag carrier works to open a business class lounge and upgrade the check-in facilities to meet its standards. Garuda has said it plans to begin operations at Halim in Feb-2014 with flights to Yogyakarta, Semarang, Surabaya, Palembang and Pontianak. But it has not set an exact launch date or loaded Halim as a destination onto its schedule and online booking engine. Yogyakarta, Semarang and Palembang are also among Citilink’s initial four Halim routes. Citilink is currently operating three daily flights from Yogyakarta and two from both Semarang and Palembang, according to the booking engine on the carrier’s website. Its fourth Halim route, Malang, is currently served with one daily flight. Indonesia AirAsia has said it plans to begin operations at Halim in Mar-2014 with Yogyakarta, Medan and Surabaya included in its initial Halim network. Halim has not yet been loaded as a destination on the AirAsia online schedule or booking engine. Lion Air also has not yet begun ticket sales for Halim. The Lion Group has been a long time advocate of re-opening Halim to commercial flights but since the final decision was made by authorities to proceed with the re-opening the group has not indicated when it will start operations from the airport. The Lion Air Group is now planning to move from Soekarno-Hatta some Lion Air-operated flights on its largest trunk routes, including Medan and Surabaya. But routes and schedules has not yet been finalised. Lion says it no longer plans to have its full-service subsidiary Batik operate from Halim. As CAPA reported in Sep-2013, the group was originally planning to have Batik’s entire Soekarno-Hatta operation move to Halim. Lion says it has decided to keep Batik at Soekarno-Hatta in order to maintain connections with sister carriers Lion and Wings Air. Batik currently only operates two routes which are not served non-stop by Lion, Jakarta to Kupang and Jayapura in east Indonesia, but in the medium term is planning to launch services to several international destinations which are not currently served by the group. Having Batik stay at Soekarno-Hatta will enable the group to connect international destinations served by Batik with the huge domestic network of Lion and regional subsidiary Wings Air. 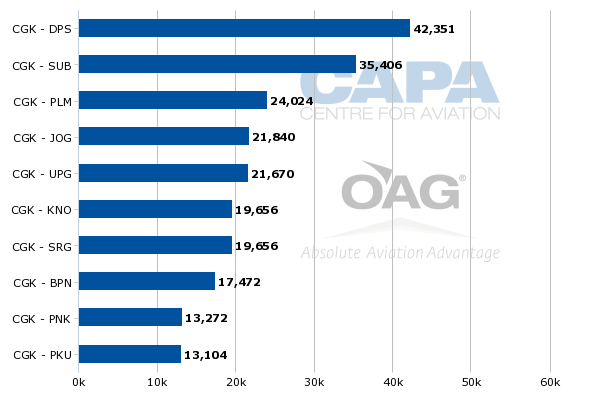 While Lion is by far the largest domestic carrier in Indonesia, accounting for 41% of domestic passengers in 2012, Batik is a small domestic player. Batik currently operates eight routes from Soekarno-Hatta with a fleet of six 180-seat 737-900ERs. It is planning to launch several more routes in 2H2014, when it receives six A320s, including more domestic routes and its first international services. While Batik’s entire Soekarno-Hatta operation can now easily be accommodated at Halim, the carrier’s future Jakarta operation would likely be too large to be entirely based at Halim. Launching international operations at Halim could have also proven to be a challenge. Halim has a customs and immigration facility, which is now used for business jet flights and Haj charters, and Lion Group CEO Rusdi Kirana previously told CAPA that the facility would be able to handle Batik international flights. But Indonesian authorities have not yet opened Halim to scheduled international flights. Halim’s customs and immigration facility would likely have to be upgraded and staffed with more employees in order to support scheduled international flights. With only a limited number of flights being allowed at Halim, Angkasa-Pura II, which also operates Soekarno-Hatta, would likely prefer to restrict the Halim operation to domestic flights. By transferring some flights on domestic trunk routes to Halim, four of the five largest domestic carriers in Indonesia will be able to free up slots at Soekarno-Hatta for other domestic routes or new international services. Soekarno-Hatta is slot restricted and generally airlines seeking to add flights at the airport are confined to very off peak periods such as prior to 06:00. 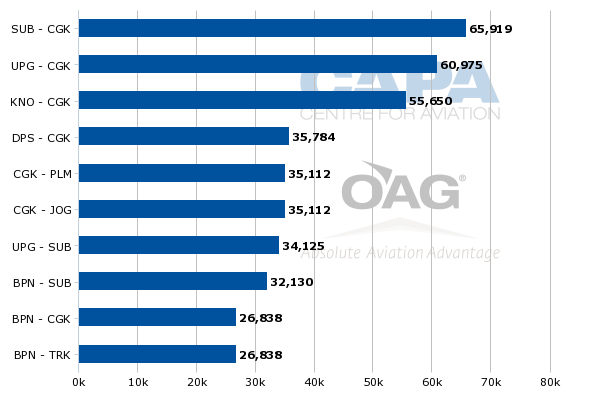 Lion Air currently has the most scheduled movements at Soekarno-Hatta with approximately a 34% share followed by Garuda with about a 30% share and Sriwijaya with about an 11% share, according to CAPA and OAG data. Sriwijaya is the third largest domestic carrier in Indonesia, accounting for 11% of domestic passengers in 2012, has not yet filed applied to move any of its Soekarno-Hatta flights to Halim. While Soekarno-Hatta is now being upgraded the expansion is focused primarily on the terminals, which now have a capacity to handle only about 22 million annual passengers. Adding a third runway at Soekarno-Hatta, which handled 58 million passengers in 2012, is much more challenging. The long-term solution is to build a new international airport outside the capital. Over the years plans for a new airport at Jakarta have progressed slowly but there has been some recent movement which could see ground breaking in 2015 for an airport that would open near the end of the decade. In the meantime some slots could be freed up at Soekarno-Hatta by using Halim as a reliever. Citilink, for example, has freed up eight pairs of slots at Soekarno-Hatta by launching flights at Halim. Citilink has moved all three of its Jakarta-Yogyakarta flights, both of its Jakarta-Semarang flights and its only Jakarta-Malang flight from Soekarno-Hatta to Halim. But it has only moved two of its three Jakarta-Palembang flights to Halim, leaving one frequency at Soekarno-Hatta, according to the carrier’s online booking engine. Citilink continues to operate 13 domestic Jakarta routes only from Soekarno-Hatta. The seven freed-up slots will likely be used by the fast-expanding carrier to add capacity on its remaining Soekarno-Hatta routes or launch new domestic routes which it does not currently serve from either Jakarta airport. Citilink has also been considering launching international services in 2014. Being able to access Halim is strategically important for Citilink as it has a relatively limited slot portfolio at Soekarno-Hatta as it is a newer carrier. Citilink reportedly aims to carry 1.1 million passengers at Halim in 2014. The LCC transported about 5.4 million passengers in 2013, compared to 2.9 million in 2012 and only 1.6 million in 2011. Citilink expects to carry about 8.5 million passengers in 2014 as it grows its all-A320 fleet from 24 aircraft to 32 aircraft. Accessing Halim will have a similar impact on Indonesia AirAsia given the carrier’s relatively small portfolio of slots at Soekarno-Hatta. Indonesia AirAsia currently operates 252 weekly return flights at Soekarno-Hatta, including 151 domestic and 101 international, according to OAG data. Malaysia AirAsia also operates 24 weekly return flights at Soekarno-Hatta. By moving several domestic flights to Halim, Indonesia AirAsia will free up slots at Soekarno-Hatta to launch new domestic or international routes, or add capacity on existing routes. Indonesia AirAsia is expected to move some or all of its flights to Medan, Surabaya and Yogyakarta. The carrier currently serves Jakarta-Surabaya with five daily flights, Jakarta-Yogyakarta with four daily flights and Jakarta-Medan with three daily flights, according to OAG data. Assuming a similar Halim allocation as Citilink of eight return flights, Indonesia AirAsia will likely continue to operate some flights on these routes at Soekarno-Hatta as it will be unable to move all its existing frequencies. Jakarta to Medan, Surabaya and Yogyakarta are all among Indonesia AirAsia’s five largest domestic routes. The largest is Jakarta-Bali, which is currently served with 60 weekly return flights. Indonesia AirAsia could also potentially move some of its Jakarta-Bali flights to Halim although Medan, Surabaya and Yogyakarta could be the priorities as they are bigger business destinations and are destinations competitors are planning to serve from Halim. 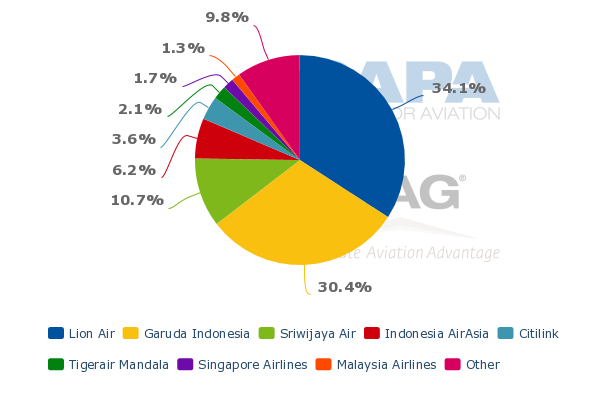 The five routes flagged by Garuda for its initial Halim operation – Yogyakarta, Semarang, Surabaya, Palembang and Pontianak – are all among its 10 largest. Surabaya (SUB) is currently served with 112 weekly return frequencies, Palembang (PLM) with 77, Yogyakarta (JOG) with 70, Semarang (SRG) with 63 and Pontianak (PNK) with 56, according to OAG data. Other top routes that could also potentially see Halim flights include Bali (DPS) and Medan (KNO), which Garuda serves with 105 and 63 weekly flights respectively. While Jakarta-Bali is the largest Garuda route based on seat capacity, Medan could be a more logical route for Halim given it is more of a business focused route while Bali is predominately leisure. Garuda will continue to operate frequent schedules on all its main domestic routes from Soekarno-Hatta as it will only move a relatively small number of frequencies to Halim. For example on Jakarta-Surabaya, Garuda now has a flight leaving every 60 to 80 minutes from 05:30 to 23:00. Even if it moves three of these flights to Halim it can maintain the frequency required by business passengers. Garuda also could potentially avoid reducing seat capacity on the affected Soekarno-Hatta routes by up-gauging to widebody aircraft. Garuda currently does not operate widebody aircraft on Jakarta-Surabaya but does on Jakarta-Bali. Having abandoned the original plan to use its Halim slots for Batik, Lion now intends to follow a similar strategy to Garuda's in using Halim to take over a relatively small fraction of frequencies on its high frequency domestic routes at Soekarno-Hatta. Lion currently offers 157 weekly return flights on Jakarta-Surabaya, 145 on Jakarta-Makassar, 133 on Jakarta-Medan and 84 (12 daily) on Jakarta to Bali, Palembang and Yogyakarta. On Jakarta-Surabaya Lion has at least one flight and in many cases two flights an hour from 05:00 to 22:00. Reducing the schedule to exactly hourly would require cutting four to five flights per day. These flights could instead be operated at Halim, freeing up slots at Soekarno-Hatta for more international routes. Lion currently only operates three international routes at Soekarno-Hatta. Some of the freed up slots could also be used by Batik, which has been relying on its sister carrier’s Jakarta slots as it does not have its own portfolio of slots having only launched services in May-2013. But the move to re-open Halim for domestic trunk routes should not be seen as a panacea for Indonesia’s infrastructure challenges. Halim, at least in the initial phase, will only absorb approximately 5% of total movements at Soekarno-Hatta. With Indonesia having emerged as one of the fastest growing aviation markets in Asia, the Halim solution will not be able to absorb even one year’s growth in Jakarta demand. The launch of more point-to-point routes bypassing Jakarta, which several Indonesian carriers are now pursuing, will likely drive more capacity expansion in the overall domestic market than the Halim re-opening. But to a large extent this simply distributes and aggravates the shortcomings elsewhere. 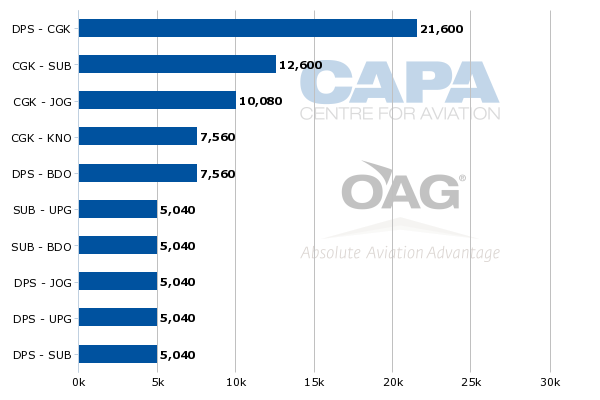 More point-to-point routes mean faster growth in other airports, many of which also now face infrastructure limitations. Indonesia needs urgently to start constructing a new airport in Jakarta as well as accelerate expansion projects across the country. The re-opening of Halim is certainly welcome, particularly as the airport’s central location should command a premium and help carriers boost sagging domestic yields. But it is only one partial solution to a huge and growing infrastructure challenge for which no serious planning is even under way.